The Montreux Jazz Festival held each July summer on the banks of Lake Geneva is one of the world’s best-known music festivals. Visitors can enjoy performances ranging from jazz to pop, and rock to salsa – many concerts are free. 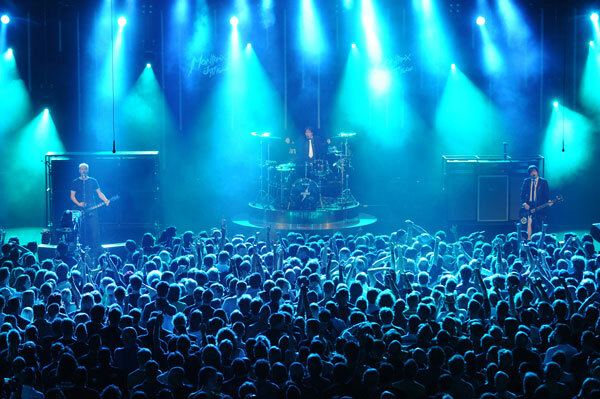 The Montreux Jazz Festival is an annual highlight on the international musical calendar. For two weeks in early July, the posh Swiss Lac Léman town Montreux hosts some of the best-known performance artists in the world for a musical extravaganza and variety far exceeding the “jazz” in the festival name. Advance tickets sell out fast but many concerts are free and welcoming to budget travelers. The 50th Montreux Jazz Festival is from July 1 – 16, 2016. The Montreux Jazz Festival is held each summer in early July over a period of around two weeks. Hundreds of musical performances are scheduled in various venues including excellent auditoriums, jazz clubs, night clubs, cafés, parks, a medieval castle, trains, and boats. The program of the Montreux Jazz Festival is usually announced in mid-April and tickets for the best-known performers sell out very fast. A wide variety of music genres are covered by the festival – Montreux is still a very prestigious jazz venue but rock and even pop music is also performed. Classical music with a more jazzy beat is also performed while Latin music and New Orleans’ jazz are particularly popular on the mobile venues. Music can be enjoyed at various venues in Montreux with ticket prices ranging from around CHF240 per performances to completely free. With the exception of Chateau de Chillon, all concert venues in Montreux are within very easy walking distance of each other and public transportation hubs. The two most prestigious venues at the Montreux Jazz Festival are the Auditorium Stravinski and the Miles Davis Hall – concerts here are staged every night from around 8 pm. Concerts are also held in Chateau de Chillon and Petit Théâtre in Montreux Palace. Free concerts are held daily in various venues including open-air Music in the Park, the famous Montreux Jazz Café and Studio 41. Various workshops, projects, and screening of archive material offer further attractions. Jazz lovers who enjoy their music on the move can go on various jazz train rides including trains from Montreux to Gstaad and up to Rochers-de-Naye peak. A few Salsa and Latin music boat excursions depart from Montreux for sailing and dancing on Lake Geneva for over 18-year olds only. Tickets for the Montreux Jazz Festival usually go on sale in mid-April – a few main-line concerts are sometimes announced. Advance tickets often sell out fast but tickets are usually also available on the day of the performance from 4 pm directly from the Ticket Service in Montreux itself. In Switzerland, it is possible to buy tickets for the Montreux Jazz Festival from Ticketcorner (Manor, Coop City, Post Office, SBB/CFF train stations) and Fnac. Fnac also sells tickets in France and Belgium. Ticket prices for the Montreux Jazz Festival depends on the individual concerts but for the Auditorium Stravinski and Miles Davis Hall generally range from around CHF75 for standing to around CHF240 for the best seats. The boat cruises and train rides are around CHF60. Special passes are also available for all concerts. The All Music Pass is valid for all Montreux Jazz Festival concerts in the Auditorium Stravinsky and Miles Davis Hall (concert times overlap so it is either or on the night) and is around CHF1500 for standing room. A pass for the best seats in the Auditorium Stravinski is around CHF2000 per week. Children under 6 are not allowed inside any of the Montreux Jazz Festival concert venues but free child-care is available for concert goers. Children under 16 must be accompanied by an adult. At the (free) nightclub venues, children under 18 are not allowed after 10 pm. See also Children and Family-Friendly Events at the Montreux Jazz Festival for more details on activities for kids. Transportation to Montreux is generally well organized with special late trains available during the Jazz Festival period from Montreux to Geneva, Lausanne, Brig, Biel/Bienne, Fribourg / Freiburg, and Bern. During the Montreux Jazz Festival period, 10% discount is available on all train journeys to and from Montreux – no concert tickets required. Hotels in Montreux are generally booked out during the Jazz Festival period but many pleasant options are available in nearby towns and cities. See what Trip Advisor reviewers have to say about hotels in Montreux, Lausanne, Vevey, Villeneuve, Fribourg, Geneva, and Bern.